Albert Schweitzer (born in Kaysersberg, Alsace-Lorraine, Germany, died in Lambaréné, Gabon) was a famous Theologian from Germany, who lived between January 14, 1875 and September 4, 1965. He became 90 years old. Albert Schweitzer was a German physician, Protestant theologian, organ artist, musicologist and philosopher. He received the Goethe Prize in 1928, des Deutschen Friedenspreis Buchhandels (Peace Prize of the German Book Trade) in 1951 and the Nobel Peace Prize in 1953 for the year 1952. He has also received the Pour le Merit and honorary citizen of Frankfurt. 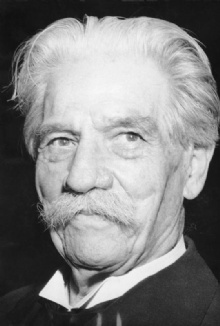 Albert Schweitzer belonged to a Alemannic-Alsatian family, and studied theology and philosophy at the University of Strassburg and pipe organ in Paris with Charles-Marie Widor. He received his doctorate in philosophy in 1899 with a dissertation on Kant's philosophy of religion. Two years later he took a doctorate in theology, it was published in 1906 as Kritische Darstellung unterschiedlicher neuerer historischer Abendmahlsauffassungen and again in 1913 under the better-known title Geschichte der Leben-Jesu-Forschung. After his studies he worked as a lecturer in theology at the University of Strassburg and priest vicar at St. Nicholas Church. He wrote a biography in French of Johann Sebastian Bach in 1905 and wrote this again in 1908 in their native language German. He is born under the zodiac capricorn, who is known for Determination, Dominance, Perservering, Practical, Willful. Our collection contains 60 quotes who is written / told by Albert, under the main topics: Happiness, Happiness. "In the hopes of reaching the moon men fail to see the flowers that blossom at their feet"
"Do not let Sunday be taken from you If your soul has no Sunday, it becomes an orphan"
"Day by day we should weigh what we have granted to the spirit of the world against what we have denied to the spirit of Jesus, in thought and especially in deed"
"Constant kindness can accomplish much. As the sun makes ice melt, kindness causes misunderstanding, mistrust, and hostility to evaporate"
"Compassion, in which all ethics must take root, can only attain its full breadth and depth if it embraces all living creatures and does not limit itself to mankind"
"By respect for life we become religious in a way that is elementary, profound and alive"
"By having a reverence for life, we enter into a spiritual relation with the world By practicing reverence for life we become good, deep, and alive"
"As soon as man does not take his existence for granted, but beholds it as something unfathomably mysterious, thought begins"
"Anyone who proposes to do good must not expect people to roll stones out of his way, but must accept his lot calmly, even if they roll a few stones upon it"
"An optimist is a person who sees a green light everywhere, while a pessimist sees only the red stoplight... the truly wise person is colorblind"
"A man is truly ethical only when he obeys the compulsion to help all life which he is able to assist, and shrinks from injuring anything that lives"
"A man is ethical only when life, as such, is sacred to him, that of plants and animals as that of his fellow men, and when he devotes himself helpfully to all life that is in need of help"
"A man does not have to be an angel in order to be saint"
"A man can do only what he can do. But if he does that each day he can sleep at night and do it again the next day"
"A great secret of success is to go through life as a man who never gets used up"
"Whoever is spared personal pain must feel himself called to help in diminishing the pain of others. We must all carry our share of the misery which lies upon the world"
"We cannot possibly let ourselves get frozen into regarding everyone we do not know as an absolute stranger"
"We are all so much together, but we are all dying of loneliness"
"Until he extends his circle of compassion to include all living things, man will not himself find peace"
"Truth has no special time of its own. Its hour is now - always"
"Sometimes our light goes out but is blown into flame by another human being. Each of us owes deepest thanks to those who have rekindled this light"
"Serious illness doesn't bother me for long because I am too inhospitable a host"
"Seek always to do some good, somewhere. Every man has to seek in his own way to realize his true worth. You must give some time to your fellow man. For remember, you don't live in a world all your own. Your brothers are here too"
"Reverence for life is the highest court of appeal"
"Reverence for life affords me my fundamental principle of morality"
"Revenge... is like a rolling stone, which, when a man hath forced up a hill, will return upon him with a greater violence, and break those bones whose sinews gave it motion"
"One who gains strength by overcoming obstacles possesses the only strength which can overcome adversity"
"One truth stands firm. All that happens in world history rests on something spiritual. If the spiritual is strong, it creates world history. If it is weak, it suffers world history"
"Impart as much as you can of your spiritual being to those who are on the road with you, and accept as something precious what comes back to you from them"
"If a man loses his reverence for any part of life, he will lose his reverence for all of life"
"I wanted to be a doctor that I might be able to work without having to talk because for years I had been giving myself out in words"
"I have always held firmly to the thought that each one of us can do a little to bring some portion of misery to an end"
"I can do no other than be reverent before everything that is called life. I can do no other than to have compassion for all that is called life. That is the beginning and the foundation of all ethics"
"Humanitarianism consists in never sacrificing a human being to a purpose"
"Example is not the main thing in influencing others. It is the only thing"
"The highest proof of the spirit is love. Love the eternal thing which can already on earth possess as it really is"
"In everyone's life, at some time, our inner fire goes out. It is then burst into flame by an encounter with another human being. We should all be thankful for those people who rekindle the inner spirit"
"The willow which bends to the tempest, often escapes better than the oak which resists it; and so in great calamities, it sometimes happens that light and frivolous spirits recover their elasticity and presence of mind sooner than those of a loftier character"
"The great secret of success is to go through life as a man who never gets used up"
"Never say there is nothing beautiful in the world anymore. There is always something to make you wonder in the shape of a tree, the trembling of a leaf"
"Man has lost the capacity to foresee and to forestall. He will end by destroying the earth"
"The first step in the evolution of ethics is a sense of solidarity with other human beings"
"The African is my brother but he is my younger brother by several centuries"
"My life is my argument"
"The true worth of a man is not to be found in man himself, but in the colours and textures that come alive in others"
"Man can hardly even recognize the devils of his own creation"
"Everything deep is also simple and can be reproduced simply as long as its reference to the whole truth is maintained. But what matters is not what is witty but what is true"
"Ethics is the activity of man directed to secure the inner perfection of his own personality"
"Ethics is nothing else than reverence for life"
"Do something wonderful, people may imitate it"
"Do something for somebody everyday for which you do not get paid"